Product information "HAIX Protector Prime Orange"
Chainsaw work is never a safe task and with it comes the responsibility of ensuring your safety from any harm. When you’re in forestry, you’ll be working with your hands most of the time but you’ll be needing your feet for stability. Without stability, you are prone to accidents, cuts, and even falling. Something you want to avoid as much as possible when you’re on duty. What comes to the rescue is the HAIX® Protector Prime, which are chainsaw protective boots designed to give you long lasting comfort while providing you with the protection you need. It’s an understanding that a good pair of chainsaw protective boots can be bulky and uncomfortable. Not with the HAIX® Protector Prime Orange chainsaw boots; they're are as comfortable as can be, so you can use it no matter what season or time of day. And with the bright color of these orange chainsaw boots, visibility is not a problem. Working at night and being effective with your chainsaw is still made possible thanks to these boots. It also features European Class 2 (24m/s) cut protection. Something you want to ensure when you’re working with dangerous heavy tools like chainsaws! European leather craftsmanship is evident when looking at these chainsaw protective boots in person. The inner lining of these HAIX® chainsaw boots is secured by Secura Liner® which means that this footwear won’t pull out or wrinkle over time. The added bonus of the two zone lacing makes it easy for you to put on your waterproof HAIX footwear without any fuss. You can adjust the lacing accordingly so these orange chainsaw boots fit your foot snugly and won’t loosen up even after hours of wear. The HAIX Protector Prime makes for the perfect chainsaw protective boot for its unbeatable ankle support and protection which helps to prevent injuries. The last thing you want to have is an accident that prevents you from reporting for duty. The sturdy and protective Vibram hiking sole in these orange chainsaw boots provides long lasting durability and is grip and slip resistant so you remain stable even on the toughest terrain. The built in climate system of these chainsaw protective boots keeps your feet at a balanced temperature at all times whether it’s hot or cold. It keeps your feet warm during cold seasons and cool during hot seasons. The vent holes on top of the forestry boot allows air to circulate inside so the temperature inside is always regulated. And with the 4-layer GORE-TEX® inner liner, your shoes are made to be waterproof, and breathable. These are chainsaw protective boots you can rely on all year! The HAIX® Protector Prime Orange chainsaw boot is protected by an anatomically formed steel protective toe cap certified to ASTM for toe protection. Additional rubber bumpers at the heel and toe area provides an extra layer of protection allowing for a prolonged service life. And because it’s unavoidable not to get hot and sweaty after a long day on a job site, you’ll need to refresh the moisture absorbing insoles every now and then. No need to worry about wearing temporary replacement boots on your next shift. The machine washable and quick drying insole ensures that you have a ready pair of boots to wear the next day. We also carry the Haix Protector Prime black logger boots. Related links to "HAIX Protector Prime Orange"
Customer reviews for "HAIX Protector Prime Orange"
Love these boots they fit like most European style climbing boots, (Scarpa, La Sporteva) order a dive or half bigger than normal and you'll be good. Do wish they came in other colors that the most bright. I feel like I have pumpkins on my feet at times but the best boot I've ever owned. I work for BNSF Railway and wear these all day, 12 hrs every day. Thru the years, I've had opportunities to try many different companies boots, mostly mid to high end. I wasn't sure if these Haix would be anything special compared to so many other's I've tried but I liked the original "orange" color and choose to give them a try. I'm not disappointed that I did. The minute you open the box and pull them out for a first look, you can instantly tell these are very well made, heavy duty boots. The thickness of the leather sides and tongue let's you know these are high end and offer significant protection. I was a bit hesitant worrying these might take a very long time to "break in" but by the second day, my worries were gone. These are some of the best fitting, most comfortable boots I've ever tried. I've spent 12 hours in these boots each day since I got them last week, and except for a little bit of "new boot pain" the very first day, I've loved them since. I like that these boots do NOT have a "logger" style high heel. I've worn that style for years, but they tend to put too much pressure towards my front foot, and my feet get tired wearing that style much faster than a medium or low heel boot, such as these Haix. These boots are very warm and have kept my feet dry so far wearing them in the rain. I don't see any problem wearing these over the winter. While offering "warmth" they also "breathe" great. My feet are not soaked in sweat at the end of the day, even after walking for miles on tough ballast. I'm really impressed with the quality of these boots and how wonderful they feel on my feet. My only dilemma was choosing orange or the lime green. I really liked the lime green but we are required to wear safety orange vests, jackets, gloves, etc... so I choose the orange. I've been fielding a ton of questions from all my coworkers asking about these "orange boots". Everyone seems to like the look. One thing, as you'll read in every review, these boots run on the larger side so make certain you order a "half size" smaller than your used to wearing. I wear a 9.5 medium and ordered a size 9. They fit perfectly. I believe a full size smaller would've been too small, yet my regular size too large, so I'd recommend a half size smaller when ordering. These are the best forestry boots I have ever used. I am in my 3rd season using them now. They are comfortable despite their rigidity. When working in the forest the footing is not always smooth and level. They have saved my ankle many times when backing away from a falling tree. I originally did not plan to use them in winter but they are very comfortable in winter as well - I add a pair of wood socks and my feet stay toasty and dry. Plus all the safety features for protecting your toes from crushes or your feet chainsaw bars. I was very interested in doing the best I could to protect my feet in case of an accident and Haix came highly recommended. I was very apprehensive about spending so much on a boot and if they would be comfortable. I have early onset of arthritis in my feet and with the wrong pair of boots it can make for a terrible day. I took a leap and bought the protector boots and instantly when I put them on they were comfortable. I have spent several days in the woods now with them and my feet feel the best they ever have after cutting for that long. The next measure of the test is to see how long they hold up. Based on my experience thus far I have a great deal of faith in their durability. Awesome boot and would buy them again. These Haix boots are some of the highest quality boots I've ever purchased. They are exactly what you'd expect from a European shoe/boot maker. The boot breathes better than any boot I've ever had, especially with the Hair functional socks, which I recommend highly. I'm only giving the boots an 8 though because Haix USA doesn't sell them in a wide size. If you have wide feet, these will get a little uncomfortable and make your ball joints sore if you were them for more than a couple of hours. If I could have ordered these boots in my size wide, I'd give them a 10. Haix makes a wide, but for some reason, Haix USA only chose to stock medium's in my size (10.5). Other than that disappointment, which is a big one when you consider the cost of these, I'm pleased with the quality. Thank you so much for your feedback on the Protector Prime Orange. We are pleased that you find our boots to be of such high quality and that they are so breathable especially when wearing our wool blend socks. These boots do actually come in medium and wide widths. Sorry that we were out of stock on the wide when you went to order. Since our boots come from Germany, sometimes it can take a little longer to get boots back in stock, especially in core sizes like yours. But we are happy that you like the boots and that they have served you well. We hope you will continue to be a loyal HAIX customer in the future. We appreciate you taking the time to review the Protector Prime Orange. We are happy to hear that this is the best boot you've ever owned and that despite them wearing out, they still keep your feet dry in wet conditions. We are also glad that these boots are comfortable and supportive on the job. We hope these boots continue to serve you well in the future and that you remain a loyal HAIX customer! awesome boots ,but was under the impression they where rebuildable, and they are not. Was truly disappointed as I really like these boots, have had them a year and by the end of this year, will need new soles. Please please please change the soles to rebuildable ones, too nice to throw away. We appreciate your feedback on the Protector Prime, Orange. We are happy that you like the quality of these boots. We apologize that you were under the impression that the soles were rebuildable. These soles are Vibram and for that reason can not be resoled. I will pass your concerns up the chain of command for consideration. We certainly hope this doesn't deter you from trying our boots in the future. Thanks again for your comments. These are a great investment! I work for a forestry consulting company in northern British Columbia and am in the field every day for 8-12 hours. I've had these boots for exactly a year now and have used them every work day except for the very cold, and deep snow days. The quality is amazing. The boots are in the same condition as when I unboxed them, only more comfortable. They're really tough, really comfortable, really water proof, as breathable as you can expect from a boot that will last, have great grip (I don't like cork boots, and these offer really good grip in their place), have an awesome lacing system, and look great. They're also great with snow shoes on the not-too-cold days. Your ankles feel extremely supported in any condition, the boot doesn't slip or rub on any climb or descent, and I'm pretty sure my foot would stay intact if I happened to step on a landmine (even if the rest of me disintegrated). They get a bit warm on the really hot days, but if you clean the interior regularly, the feet stay very happy. I'd say on average these have seen 8-10 on-foot bush kilometers daily for 8 months, in every condition (from nice pine flats, to swampy black spruce areas, to some of the gnarliest, blown-over nightmare timber stands out there). My feet are very happy, the boots are still in better than perfect condition, and I'll be a Haix customer for as long as you guys make these awesome boots. The tread is still impeccable so I can't see them needing resoled for years. Treat these boots well (clean and treat when required and dry slowly from the inside-out), and I imagine they'll take care of your feet for years. Wow, thank you for taking the time to give such a glowing review of the Protector Prime Orange. We are so happy to hear that the boots have served you well over the last year. We appreciate your feedback on the quality and comfort of the boots with great grip while on the job. We are also glad to hear that the boots are offering your foot optimal support. We appreciate your comments on the cleaning and maintaining of your boots. We really strive to push that mentality to all our customers. Thanks for your recommendation and your loyalty to the HAIX brand! I ordered the same size I normally get in boots. Once I received them, I tried them on only to find they are too big. Unfortunately, I just now spoke with a customer service rep from Haix and they informed me the Protector Primes actually run about a half size too big. I'm hoping that my blunder in ordering can save people from a frustrating experience like mine. At the time of this writing I can not find any information from Haix about "fit". Attention Customers: MAKE SURE YOU ORDER A HALF SIZE SMALLER THAN WHAT YOU ACTUALLY WEAR. Other than actual fit, these boots are very well constructed and I can't wait to get the correct size to start wearing. Thank you for your feedback. We are happy to hear that you have such a favorable opinion of the Protector Primes as far as construction. As far as fit, these boots do run a half size bigger than some of our other boots. All our boots are different. Some do run larger while some run true to size. It depends on the boot. We are currently working on getting more sizing information onto our website to better help our customers get the right fit. Again we appreciate you taking the time to share your experience with us and we hope you'll continue to be a loyal HAIX customer in the future. I ordered the same size I normally get in boots. Once I received them, I tried them on only to find they are too big. Unfortunately, I just now spoke with a customer service rep from Haix and they informed me the Protector Primes actually run about a half size too big. I'm hoping that my blunder in ordering can save people from a frustrating experience like mine. At the time of this writing I can not find any information from Haix about "fit". Attention Customers: MAKE SURE YOU ORDER A HALF SIZE SMALLER THAN WHAT YOU ACTUALLY WEAR. Other than actual fit, these boots are very well constructed and I can't wait to get the correct size to start wearing. I bought a pair of these Protector Orange boots about a month ago. They took a couple days to break in. After that they are as comfortable as can be and I sometimes forget I have boots on. The fit was normal for my normal size. I do wear them with some thick Thor-Lo High Top Ski Boot socks. They seem to handle variety of temperatures pretty well as I worn them in the snow in the 20s F / -0sC and into the 60s F /16+ C with neither cold nor hot feet including plowing snow on my tractor for 2 hours in the open air sitting. The high top provides excellent support and the Vibram soles are sturdy. I live at a wooded mountain location so the chainsaw safety was important to me. I also wear these quite a lot walking and doing trail maintenance as a volunteer on the Appalachian Trail. I was wearing athletic shoes on the AT but after wearing these high tops, it's easy to walk right over protruding rocks without even looking where one is walking. These are way better then my old heavy Vasque leather hiking boots; although they are a work of art too. Thank you for taking the time to review the Protector Prime Orange. Those boots do take longer to break-in due to the full-grain leather used throughout. But as you found out, once they are broken in they are comfortable on the job. We are happy to hear that the climate system has kept your feet at a balanced temperature at all times and that you have found that the boots offer excellent support for your ankles and feet. We appreciate your service. Stay safe out there! Best work boot I've had yet. I'm a environmental field tech in the north and work anywhere from 60° Lat to above the arctic circle and preform an extremely wide range of jobs. I got these boots because of the wide range of features and certifications required for many work sites im on. When I first got them, they were hella stiff but I just decided to wear them as my daily boots. Now I like them so much I regularly reach for them when I'm just going out to the shop. I recently had to do some field work out in -32°C. I grabbed these and was pleasantly surprised that they were warm enough (I was moving all day) I'm interested to see how warm they are in the summer but they seem ok indoors. They fit like a glove and the soles grip on ice well and stay soft in the cold. I love that I can just pick up a saw and know my boots are good to go. I'll definitely be looking at more Haix boots in the future but I expect these will hold up well. esp with the option to resole. The boots are worth every penny.....(Nickle?) and they replace 3 types of boots I had to have to preform my job. Way cheaper in the end. Wow! Thank you so much for the glowing review on the Protector Prime Orange. We are very happy to hear that they have been keeping your feet warm and protected while on duty out in the elements. These boots do require a little extra break in time due to the full grain leather used throughout. We are glad to hear that you got your moneys worth out of these boots and we hope they continue to serve you well in the future. Stay safe out there! So far really impressed. This will be a good logging boot. I still need to really break them in. Have used a low cut style for the last couple of years from Haix and they are great also. Figure it will be some time before I need another pair. Thanks for your feedback on the Protector Prime Orange. Our boots an take a little longer to break in than others due to the thick, full grain leather used throughout. While this does extend the break in period a bit, it will help ensure a much longer life. We hope they will continue to serve you well in the future. I've been wearing them for about a month daily. These by far are the best boots I have owned. First off they are comfortable, waterproof, and dirt/debris do not get in. After scoring some black USAR boots on eBay, I went straight to the factory site and looked for a boot that would solve some of my daily issues. 1. On construction sites, boot are more and more scrutinized. But toe protection had ALWAYS been uncomfortable and clunky. - this boot is perfection, the toe protection is not the least bit noticeable. 2. Cut protection is coming, this boot solves it. 3. Comfort and support, the best. - this boot feels like articulated ski boots you can walk in and your foot is embedded in whipped cream. Imcant walk anywhere on the job site without someone asking about the unusual orange boots. I wonder how many I have sold? What I tell my associates is the undetectable toe protection... That usually does it for everyone . I am now ordering black ones for going out boots. Yes, going out on the town, I wear Boots everywhere...,these boots will be worn everywhere. Thanks for the glowing review! If you are happy, we are happy! While it is very common for our customers to praise the comfort of our boots, I have to admit, I have never heard the term "whipped cream" used as a descriptor. Thanks for taking the time to share your experience as well as provide a little humor... we appreciate it! Stay safe. Thanks for taking the time to write a review of your experience with our Protector Prime. We are happy to hear that they are working out well for you. I am currently in line-school preparing to apprentice as a power line worker. Hesitant to accept the old-fashioned line boot simply because it's "what everyone uses", I began online research to find out what other Utility Workers, linemen and arborists were using. Approximately 8 years ago, it appears that some linemen out of California were starting to use a heavy-duty, mountaineering style boot on the job - for comfort, weight, durability and water resistance. These reviews were my inspiration to find a green-patch (CSA approved), "mountaineering style" boot for my class and into the workforce. Danner - my "slippers" for the past 5 years. Tried climbing in them and immediately knew comfort would be an issue, even in the short term, as my knees hurt and I could feel my instep twisting under body-weight load. The usual Mark's Workwear House fair (Dakota, Cat, Terra, JB Goodhue), inexpensive, but generally lacking in quality - small steel shank, more pliable sole, lesser quality, not rebuildable, generally made in China. Wesco - traditional - factory seconds are very reasonably priced; heavy leather; possessed none of the extras I wanted (gore-tex, aramid, etc). Canada West Boots - Canadian - traditional - nice two-tone brown; leather=heavy, price point was an issue considering the boots did not meet my criteria. Haix - non-traditional look and composition, Mountaineering boot with steel toe, green patch (CSA/ANSI approved) safety toe, right height, good heel, correct size available, priced right in the middle of my budget, great reviews and photos on Arborsite courtesy of Aldegar, Gore-Tex. These boots met all of my initial criteria. Naturally, I chose Haix Protector Prime. -right off the bat, I leaned heavily towards Haix based purely on asthetics. At first blush this boot met my criteria in spades. But what followed is what sealed the deal for me - Customer service. I recently killed my phone and lost all my contacts, but I believe it is Melissa with whom you speak upon first calling Haix. I was hesitant to order, sight unseen, a boot which would be part of my life for hours at a time. However, Haix' customer service has been without equal. She patiently answered all of my questions (and continues to do so when I call), addressed all of my concerns and provided (what proved to be) accurate sizing information (gender, foot width, socks, etc). She was incredibly friendly, competent, knowledgeable and accommodating - she was able to work around Haix' "non-delivery" to Canada in order to get my footwear to me (via my sister-in-law in Chicago). First impressions? Aldegar's review on Arborsite was spot-on! These boots will blow your mind with comfort! -Extremely light - noticed this at the post office before I'd even unwrapped the box. -Exceptionally well made - what would I expect from a product engineered in Germany and manufactured in Croatia? Very well glued; no over-glue marks; lovely riveted eyelets; two zone lacing (like my hockey skates); vibram sole with appropriate heel height; did I mention the colour? -beautifully comfortable footbed - I have worn these boots for the past few weeks, day in and day out, without my orthotics! My foot felt "at home", almost slipper-like, from the first time I wore the boots. -"slightly gummy" (per Aldegar) vibram sole appears softer than previous iterations I've encountered - to my surprise I walked silently through the college - none of the clomping about experienced with previous work boots. -Tongue is sturdy, well constructed, heavy duty, gusseted, Aramid patch on shin, Aramid fibres throughout vamp and upper. -round laces, "textured", for better knot-holding capability. -rubber toe and heel protection provides durability. 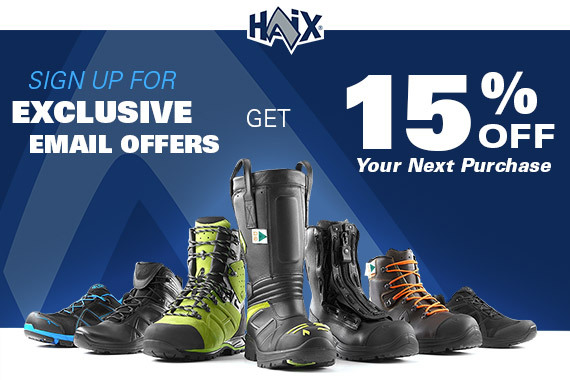 -Haix has an outstanding warranty on their boots and they can be rebuilt by Haix. Right out of the box I took these boots on a short 5km hike in Cape Chignecto Provincial Park over steep and varied terrain. The trail is an excellently marked, well-maintained, forested trail with steep grades, plank bridges, several flights of stairs and a cobblestone beach. During and after the hike, I did not get any blisters, nary a hot spot and not so much as a squeak from the leather. Two-zone lacing fantastic idea - keeps foot firmly planted in footbed, heel in place, accommodates high arches, allows rest of leg (shin and calf) freedom of movement. With my heel firmly locked in place, the rear portion of boot holds my foot while the upper and gusset bend comfortably with no blisters on back of heel. I did re-tensioned the laces at the vamp "level" twice on the hike to accommodate the changes precipitated by a little heat and a little sweat, but the laces held firmly in two-zone clips, and my top knot held with no-retying necessary (i fold my socks over top of boot to secure lace-knot). I was confident in the stability of boot - it felt like my knee would give a million years before my foot/ankle ever would. These boots are rigid and sturdy without being restrictive, uncomfortable and unforgiving. I have my own wood lot whereby I harvest my own wood for firewood and mill my own lumber. If I were using these boots simply for their intended purpose - as a Forestry boot - I have absolutely no reservations recommending these boots to anyone. However, I purchased these boots in order to climb poles - as a lineworker boot. Third impression - first climb - standing, playing, working 2 hours on the pole. -the footbed was blessedly rigid - shank, midsole, puncture protective and Vibram sole all performed beautifully to provide me with an extraordinarily comfortable platform on which to stand in spurs. -no backwards (taco-like) flex in the sole. None. Zero. Zip. Zilch. Would I recommend these boots for line work? Although my experience is limited, I have not hesitated already to recommend these boots to anyone in forestry, construction trades, and for everyday wear (if you're into that kind of thing!). - Long-term durability - there is a rub mark on inside vamp near ball of foot where my foot rubs the pole. I'm hoping this does not develop into a hole - this is the only area where the boot shows itself as being a forestry rather than lineman's boot. I agree whole-heartely with Aldegar's assessment and would go further... to say that these boots are comfortable enough for everyday wear, rigid enough to provide a very stable platform while climbing, light enough to climb all day. They are fantastic and I would buy them again - without hesitation. Everyone one in my class has asked about the boots, and I've been asked a lot of questions by various students at my trades college. Would love to include photos in review - Haix, can you accommodate photos in the review field in the future? Not arriving at a decision sooner so that my classmates would have considered Haix Protector Prime before their purchases. WOW are these boots fantastic! Just received them and walked around the block to check them out before I put them in service. These will last years. Quality at it's finest. I learned you always get what you pay for and am excited to use them. And I really like the extended wear program, which was a pleasant surprise. The workmanship is truly world class. I will have many friends and co-workers asking where, how and when they can purchase their own boots. Order your own pair and become a believer. The last pair of boots you will ever buy! Thank you.